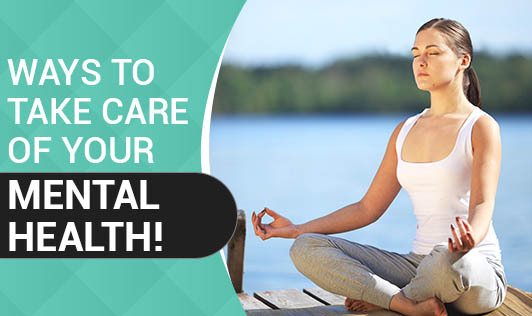 Ways to take care of your mental health! Anybody can make simple changes in their lives which can have a major impact on their mental health and wellbeing. The way you think, feel and your ability to deal with life's ups and downs can go a long way in maintaining good mental health! • Express your feelings: Expressing and talking about your feelings can help you stay in good mental health and deal with life's challenges. • Eat well: There are strong links between what we eat and how we feel. For instance, caffeine and sugar can have an immediate effect. Similarly, food can also have a long lasting effect on your mental health. • Be mindful: This is all about focusing your attention on the present. Not worrying unduly about the past and future problems can be beneficial to your mental health. • Relax: Taking a five to 20 minute break at work can be good enough to de-stress you. • Stay active: Exercise releases chemicals in your brain that make you feel good. Regular exercise can boost your self-esteem and help concentrate, sleep, look and feel better. • Connect: Connect with friends and family as they can give you different views from whatever's going on inside your own mind. They can keep you grounded, active and help you solve practical problems. • Ask for help: If you're unable to find solutions to your problems and you feel you can't cope, ask for help! • Value yourself: It's important to treat yourself with kindness and respect and avoid self-criticism. • Set realistic goals: Aim high, but be realistic and don't over schedule. You will enjoy a great sense of accomplishment and self-worth as you progress towards your goal. "Good mental health helps you enjoy life and cope with problems! Remember that you don't automatically have good mental health just because you don't have mental illness. You have to do the needful to keep your mind healthy!"